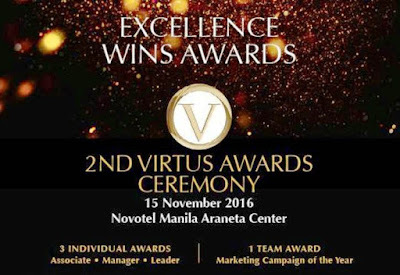 The Hotel Sales and Marketing Association (HSMA) - an association of hotels and resorts sales and marketing leaders in the country - with the support of the Department of Tourism and the Tourism Infrastructure Enterprise Zone Authority, will announce the winners of the Virtus Awards 2016 on November 15, 2016 at the Novotel Manila Araneta Center Quezon City. 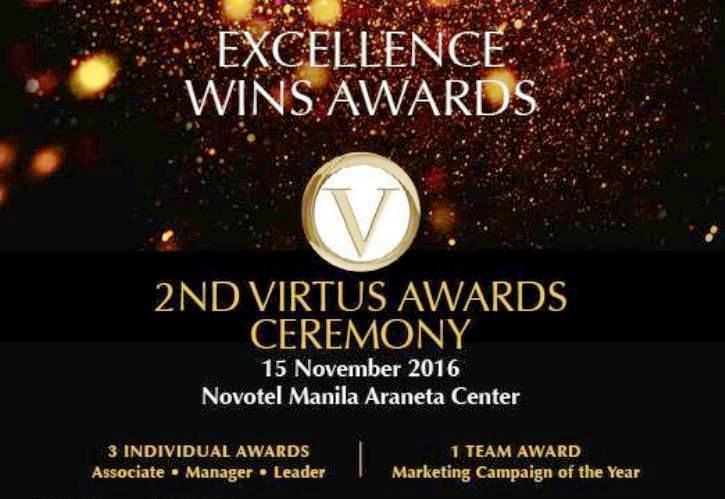 The Virtus Awards is on its 2nd year and the 2016 edition was launched last May 2016 to honor hotel sales and resorts marketing practitioners with a record of success in integrating creativity and dedication into strategies that deliver benefits to guests and a robust bottom line to their properties. Four winners will be declared in the multi-category initiative that includes outstanding Associate Manager, Leader and Marketing Campaign in a glittery formal event befitting the Sales force, the lifeblood of the business. The Virtus Awards Organizing committee is composed of Margie Munsayac - HSMA President and VP Sales and Marketing of Maribago Bluewater beach Resort, Rose Libongco - Virtus Awards Chair and HSMA Charter Director, Christine Ibarreta - Virtus Awards Public Relations Head and Director of Sales and marketing of Golden Phoenix Hotel and Cielo Rebodero - Was and Means head and Director of Okada Manila. Munsayac affirms that new openings of hotels and resorts in the country highlight the growing importance of sales and marketing people. "The hotels and resorts sector is a most competitive field in tourism and the role of Sales at the forefront of promoting their properties cannot be overemphasized. 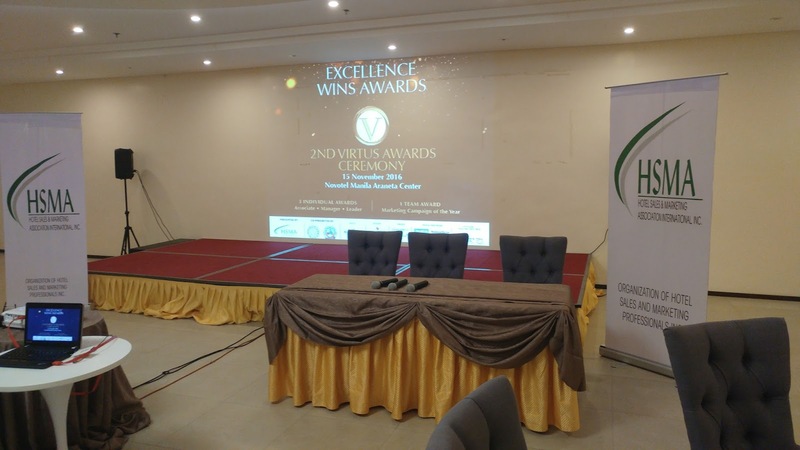 Virtus which is a Greek word for excellence, ensures that the best practices in sales and marketing are given due recognition," Munsayac said. Twelve judges, three per category, convened with the nominees in a full day of interview and presentations to select the four winners. An independent auditor will tally the scores and awardees will be known only on awards night. The panel of judges includes the following : Ma. Corazon Jorda - Apo (Director, Market Development Group - Thailand, Indonesia, Vietnam Department of Tourism), Ma. Christina G. Aquino (Executive Director for Planning and Development, Lyceum of the Philippines University), Cesar R. Cruz (President, Philippine Tour Operators Association), Millie F. Dizon (Senior Vice President for Marketing and Communications, SM Reatil Inc), Leny R. Fabul (Executive Director, Philippine Hotel owners Association, Inc), Henrietta L. Ho (Founder/Principal, Break Thru-Solutions in Marketing), Cesar Jose C. Jesena, (Head, Tenant management Division Shangri-La Corporation), Donald Patrick L. Lim, Ph.D., (Chief Digital officer, ABS-CBN Broadcasting Corp.), Isabelita Sy-Palanca, Ph.D., (President, The Mother Company), Lyn Gueco-Tamparong (Past President, Hotel Sales & Marketing Association), and Maria Concepcion M. Yabut (City Councilor First District - Makati City). Libongco revealed that judges remarked on the entries and said they had difficulty in rating because of the quality of the interviews. "The statements of the judges pleased the organizers because the focus of the Virtus Awards is to raise the bar for the sales and marketing personnel, to give outstanding performers a channel where they can take pride in their accomplishments and to set their sights on new opportunities for business and personal growth. We are also on a quest to inspire young people to pursue career options in hotel sales and marketing," according to Libongco. For inquiries and information, please contact Christine Ibarreta, Virtus Awards PR Head, at virtuspg@gmail.com. HSMA was organized in 1976 after the proliferation of new international hotels which were established for the IMF-World Bank Conference. The founders aside from Libongco were Melvin Cruz, first president; Aurora Paredes, Michael Cuisia and Peter Leitgeb. The objectives of the HSMA include to professionalize the conduct of sales and marketing, to promote the Philippines and member properties; to educate, train and update members on hotel and tourism developments and to represent hotels and resorts in travel and tourism forums.